KOTA KINABALU: Bingkor Assemblyman Jeffrey Kitingan said Putrajaya was refusing to accept the reality that Sabah lost more than it gained from the Federation of Malaysia and that the damage done was almost irreversible. Kitingan said Brunei and Singapore were examples for Sabah and Sarawak to move forward. “It is as though Sabah has never had it so good or any better and that if the state had not joined Malaysia there would be no progress and development, ” said Kitingan, who is also the Star Sabah Chief. He said these arguments were weak because Sabah was now the second poorest in the Federation, relegating Sarawak to being the poorest. 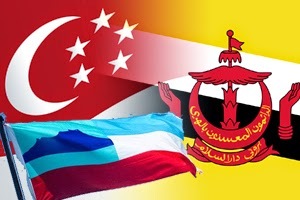 He also took exception to statements that an independent Sabah would be eaten up by its neighbours or infiltrated by Islamic State (IS) militants bent on taking over the state and creating an Islamic caliphate. “Putrajaya is in a state of denial. They just refuse to accept the stark reality that Sabah lost more than it gained from the Federation of Malaysia,” he said. Kitingan said the damage suffered by Sabah and Sabahans was almost irreversible and probably beyond repair. “The demography has been totally changed with population re-engineering and reverse ethnic-cleansing through Project IC/Mahathir. “We have lost our political franchise to the illegals on the electoral rolls. “Is it any wonder that the MNLF and Abu Sayyaf in the southern Philippines are supporting IS militants when our own Prime Minister has called for Umno members to follow the example of the IS militants?” he asked. Kitingan said the security nightmare in Sabah was a monster created by the Federal government’s covert operations in southern Philippines to train and arm Muslim insurgents, including the MNLF and Abu Sayyaf. He said all this would be evident if the Royal Commission of Inquiry report was released. He added that the Federal government could not be trusted with the security of Sabah. Sabah and Sarawak, better together in Malaysia?